This fantastic and exquisitely furnished business center installation represents some of the most highly desirable and widely sought-after workspace solutions in the region, with an array of diverse and fully functional serviced office suite services available for prospective tenants to utilise and help develop their commercial presence in a thriving corportate community. The regional transport links are also fantastic and make the building easily accessible. This exquisitely furnished and fully functional business center location is set within a highly prestigious and contemporary landmark office building, conveniently located in one of the most exclusive and economically significant commercial districts in the city. The immediate surroundings are widely renowned for their business prowess and significance, and also offer a number of frequent transport services. These executive suites located in West Hollywood offer a unique architectural design with high spec network access and telephony with tailored tenancy leases. This is a high quality and well managed building. The regional transport links are also excellent and offer clients a significant ease of accessibility to the complex due to the number of frequent and convenient services in operation throughout the locality. Situated conveniently in close proximity to some of Los Angeles' very best sites of public interest, tourist attractions, entertainment venues, leisure pursuits and local amenities and services including fantastic local restaurants, shops, retail outlets and more; this professional and contemporary business establishment offers prospective tenants workspace solution packages and on-site corporate services ideal for any type of industry. 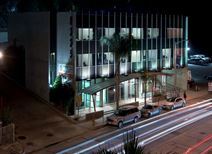 This serviced office enjoys a glamorous location on world-famous Sunset Boulevard, and is easily accessible by road and metro. These light, airy offices are located in a stylish office building, and parking is ample. Many other creative sectors are in the vicinity, including TV and recording studios and music industry businesses. The regional transport links are also excellent and provide numerous extensive services.